I think a lot about ways that I can make steps to preparedness look “normal” and “doable” for the doubters in my life. Also, I have been thinking about alternatives to MREs. Those two things collided in my mind when I saw a display of cookbooks in an Amish store. They all featured Meals in a Jar. I perused the selections and found one that also worked perfectly into my children’s desire to make gifts for their various teachers. I bought Gifts in a Jar For Kids by G & R Publishing. The older children read through the recipes and chose which they wanted to make themselves. The not-quite-readers I steered toward the ones with only a few ingredients. They really loved the S’mores Squares Mix because they got to smash up a whole sleeve of graham crackers in a ziptop bag! There were some recipes for unusual things (like Potato Chip Cookies), brownies, bars, mini-muffins, and cookies. Our homeschool enrichment group includes several people with nut allergies, but we found recipes that would work for those folks too. We layered the ingredients in quart canning jars and included the cardstock instructions for baking them strung on a festive ribbon. They were pretty, but best of all, they allowed the children giving the gifts to feel they had personally invested in the present. They were a big hit. There are several other titles by that publishing group and others. In addition, if time is too short to get a cookbook, try looking on the free recipe websites for ones that will work. I have purchased some others books and plan to try them out and review them for you sometime in the future. If you’ve been organized and on-the-ball, you may not need any last minute gift ideas for Christmas. These would still be great presents for birthdays, hostess gifts, and so on. Just tie on a seasonally appropriate colored ribbon, maybe over a pretty circle of cloth, and you’re set. I really appreciated the gift of S’mores Square Mix that I received. It makes me appreciate it even more knowing that the “littles” helped smash the graham crackers. I can’t wait to try it. I meant to while they were visiting but we ran out of time. Need a longer visit next time. Thank you so much for the gifts and especially the time with my grandchildren! Merry CHRISTmas to all of you! 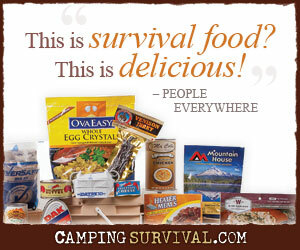 Reblogged this on Bug Out Survival.